Any advice is warmly appreciated! You'll need to use a 6-pin pci-e cable. I use the word triangle here loosely to denote a pin that isn't square. The primary difference being the middle "pin" in the top row is a triangle on the PCI-E cable and not a Square. Accordingly, I know it will fit, because a triangle with go into a square (but not vice versa). Remember that the PCIe Cable on the Solid 8-Pin side that plugs into the Power Supply on all of the Cables. You do not need all 3. But you cannot only use the 6-Pin Connector. I have that same layout Asus x299 Sage and Evga Supernova 1600 T2 watt power supply. That connector on that motherboard is for the power of the pci express x16 slots and also remember that the board has two PLX switches to run pci-express slots on all 7 will run at x8 and if you use 1,3,5,7 will run at x16. You need to connect one cable from the VGA connector on the power supply to that of the motherboard a 6 pin connector. Pozzallo, to be specific, do to you do the following: Use the 6-pin part of the 6+2-pin VGA cable? 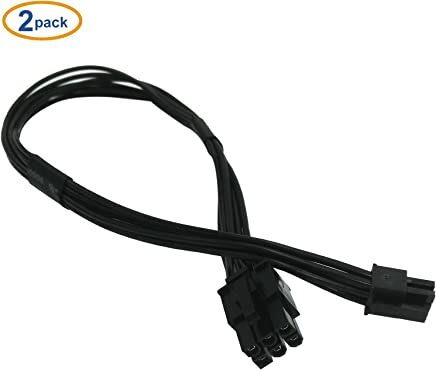 Specifically, you plug this 6-pin into the EATX12V3 on the mobo and you connect the other end of the cable to one of the VGA outputs on the EVGA T2 1600? bcavnaugh, I have already connected successfully the A, B and C connectors as you have outlined from the manual (which I have read cover to cover, but find useless). I understand I should not plug in the 6-pin cable if I don't plug in the others. 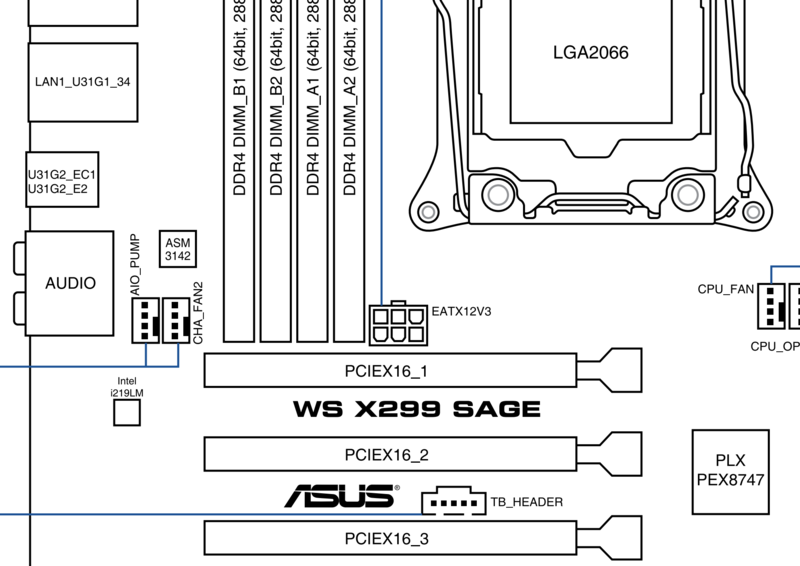 However, as per my sentences above, I am curious as to which PSU cable will safely accommodate the 6-pin connector on the Asus X299 motherboard. To reiterate, will the standard PCIe VGA 6+2 pin suffice (using only the 6-pin part) ? will the standard PCIe VGA 6+2 pin suffice (using only the 6-pin part) ? Yes I think that is that is the only way because of the cables from the power supply does not have a 6 pin by its self it is with a 6+2 pin and the other end to the VGA connector on the power supply. So the 6+2 pin part of the cable is not connected to anything. This is the kind of help with pictures, links and details that makes it easy to award a ribbon to the post. @bcavnaugh I am currently plugged in with A, B and C. I am keen to try plugging in D as well (the 6-pin) since I am having problems seeing all four of my GPUs in bios and get a B2 post error 4 out of 5 times. Once I saw two GPUs, but that didn't last long (and only happened once in dozens of reboots). It "feels" like a power issue, so I'm really just asking whether I can use the 6 part of the 6+2-pin VGA cable in the connector labelled D on the motherboard diagram. The question arises because of the slight keying difference. Sajin has answered positively... so I'll give it a go. @Pozzallo, do you plug into EATX12V2 as well as EATX12V1 ? I was hoping that by plugging into EATX12V3 I would resolve my post issues where b2 error code often shows up and also only 1 GPU appears in Bios/Windows. I tried removing the 8-pin into EATX12V2, but didn't help. Did you go with 2 Separate PCIe Power Cables to Each Graphics Card or only One Cable to each? 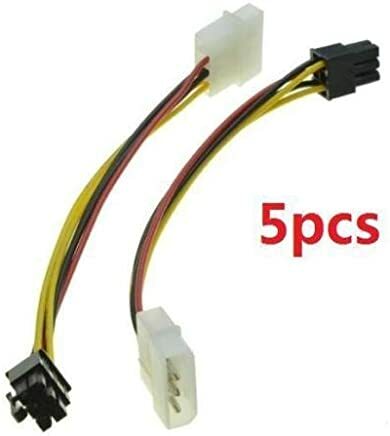 I would recommend 2 Separate PCIe Power Cables anytime a Graphics Card has two Connectors. You do not need to connect this unless using multiple high power graphics cards. @pozzallo: makes sense to me; this is exactly how I have connected mine. @bcavnaugh: Yes I am now using ALL 9 VGA power outputs from the PSU, two for each of the GPUs (to make up the 2x 8-pin required for each card) and one for the motherboard EATX12v3 6-pin connector. 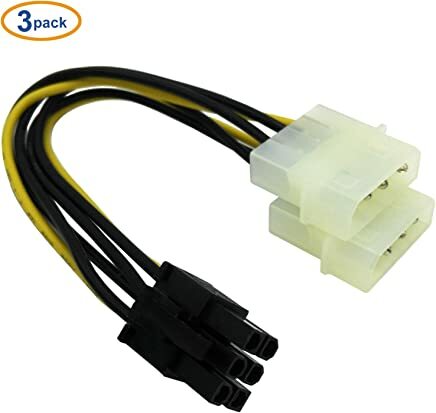 I once used a 4-Pin Molex X2 to 1 6-Pin VGA Connector for the Motherboard to free my PSU PCIe Cable. Easy to for a 6-Pin but not for a 8-In as it uses 2 6-Pin to create on 8-Pin. Both uses to come with your Graphics Card but now I only see the 2 6-Pin to create the one 8-Pin. Well I've connected all the cables just fine, using the ones I had. It seems as though my 6+2-pin VGA cable is sufficient for the EATX12V3 6-pin mobo connector. However, it hasn't help me with the underlying issue, which I described above as b2 error 4 out of 5 boots, plus only 1 GPU showing in Windows (or Bios)... sometimes I see 2, but that has only happened twice out of 30 reboots or more. Have you Pulled the Battery from the MB to Or maybe needs a Bios Update. On EVGA MB some have Dip Switches that allow us to turn off PCIe Slots. B2 and seeing that it refers to "Legacy Option ROM Initialization" >>>> Disable CSM in your Bios maybe. But I would also Disable any feature in the Bios that that you are Not Going to be using, like the Raid Controller. Check the Pins in all your connectors Both Side, one or more may have been pushed out or not all the way in. Issue: Intermittent (90% of the time) B2 post error (with Boot led on motherboard) and only 1 of 4 GPUs showing in Bios and Window 10. GPUs were tested individually one at a time in PCIe Slot 1 while on Air Cooling and all worked. Never tested in multi-GPU config until now. I can sometimes rarely get to Windows, without a pattern on why. Regardless, only ever see 1 GPU (not 4). Seems to always boot to Windows after CMOS button reset. Turning off "fast boot" in Bios seems to help with getting into Windows, but unsure. Only one of four GPUs showing up in Bios or Windows 10. Specifically, first slot GPU is showing in BIOS and Windows. GPUs in other slots do not appear in Bios or Windows. Windows 10 installed with UEFI and Secure Boot on. Have tried booting without Secure Boot. No difference. Have flashed Bios with latest version 0905. Have updated to latest GeForce Windows 10 drivers, not that I expect this to make a difference. Have reinstalled Windows 10 without impact. Have tested supplying power to just one GPU at a time, in each slot respectively. Only when power is supplied to top slot GPU will Windows boot at all. Power supplied to GPUs in any other slot gives b2 error with white "VGA" led on Motherboard (as opposed to "Boot" led on motherboard as described above). 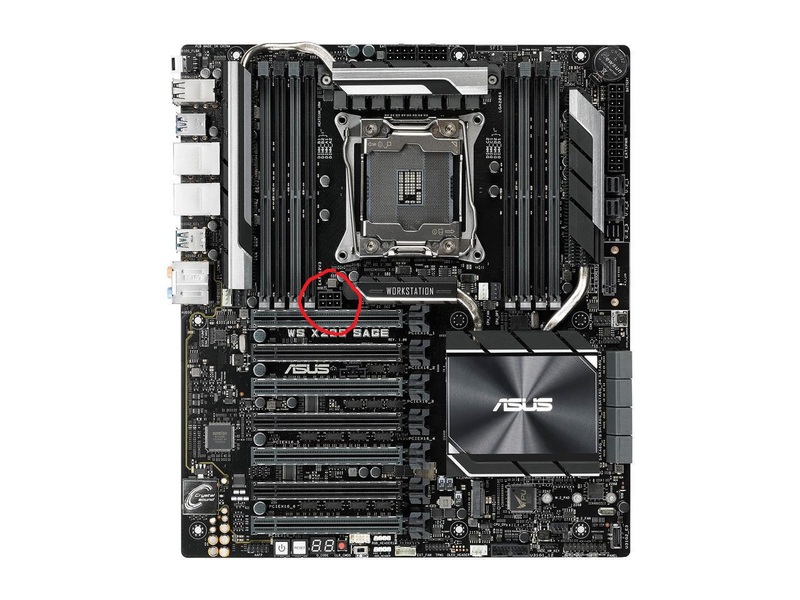 Are all the Cards Locked in the PCIe Slots? Let's hope that it is not being caused by Bent CPU Socket Pins. Yes all the cards are locked in firmly. Not seeing this info in this Thread but do you have a 44 Lane CPU? "Have updated to latest GeForce Windows 10 drivers, not that I expect this to make a difference." But if you do not see the Graphics Cards in the Bios then Windows will not see them as well. Yes the i9 9900X (BX80673I99900X) has 44 lanes. I've already tested each GPU in slot 1, and they all worked. Would the setting 'Above 4G Encoding' be relevant here? Has anyone else successfully booted 4x 2080 Ti GPUs ? ASUS Above 4G Decoding or ASUS Above 4G Encoding? Normal graphic and GRID cards should always be mapped below the 4GB address space. Grid cards should have that option set to DISABLE. Tesla Cards should have it Enabled. Yes sorry I miss-typed - I meant Decoding. I don't know what constitutes a Grid card, but I tried enabling it and it didn't help my issue so I have disabled it again. It Must be Disabled for GTX and RTX Graphics Cards. The RTX Graphics Cards are not Tesla Cards. Yes that is why I have ensured it is disabled. Any other feedback for my problem?